This section is concerned with the findings of social or urban dialectology on linguistic variation. Urban dialectology studies language variation in urban regions. Classic studies within this area focus on variation in cities such as New York, Chicago and Detroit in the USA and Norwich in England. Urban dialectology is traditionally concerned with the influence of the extra-linguistic social factors of social class (socioeconomic status), gender, age, and ethnicity on the occurrence of variation. Investigating the principles of linguistic variation with respect to diverse social factors, urban dialectology has revealed typical sociolinguistic patterns, i.e. patterns of characteristic and systematic linguistic distribution or stratification. Urban dialectology constitutes the core area of sociolinguistics and is also referred to as variationist sociolinguistics or simply as the variationist approach. Within urban dialect studies a linguistic variable is a linguistic phenomenon which can occur in variant form. For instance, the pronunciation of the suffix –ing is a phonological variable. 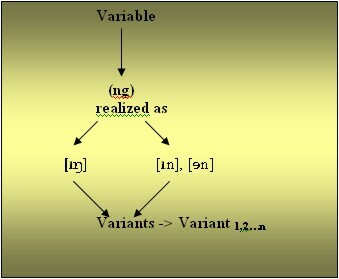 The different possible ways of linguistically realizing a variable are referred to as its variants. Thus, the pronunciation of –ing in a word like feeling may vary between the standard velar nasal [ɪŋ] and the alveolar nasal in forms like [ɪn] or [ən]. [ɪŋ], [ɪn] or [ən] are all variants – possible concrete realizations – of the variable (ng). In urban dialect studies linguistic variables are related to different non-linguistic variables, e.g. the social factors of class, gender, age, and ethnicity. The aim of this correlation is to gain insights into the general nature of linguistic variation: which variant is used by whom? How frequently is it used? When is it used? Urban dialect studies have shown that there is a relationship between the social characteristics of speakers and their use of certain variants.